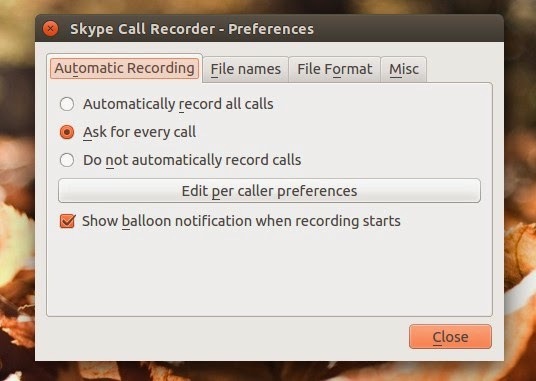 Skype Call Recorder is a small Linux utility that lets you record your Skype calls easily. The application can record all Skype audio calls automatically or you can set it to ask before recording a call. 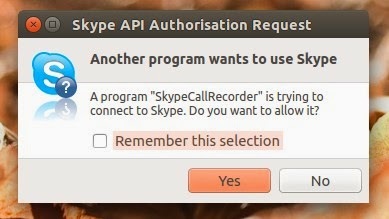 Enable "remember this selection" if you don't want this popup to be displayed every time you start Skype, then click the "Yes" button. All calls are recorder under ~/Skype Calls ("Skype Calls" folder in your home directory) as mp3s, but these can be changed from the Skype Call Recorder preferences. * Ubuntu users: ignore the fact that the download page says "Ubuntu 13.04" for the latest Skype Call Recorder version. The application should also work on Ubuntu 12.04, 12.10, 13.10 and 14.04. Also, make sure you download the latest version! ** The rpm files available on the Skype Call Recorder downloads page are very old so it's probably better to compile it from source if you use Fedora, etc.